The Rev. Kenneth Brannon presided over the annual Blessing of the Animals celebration honoring St. Francis of Assisi, patron saint of animals, on Sunday at St. Thomas Episcopal Church in Sun Valley. The downstairs portion of the church was packed with canines, felines, feathered creatures and gerbils all being reined in or caged by bemused worshippers. 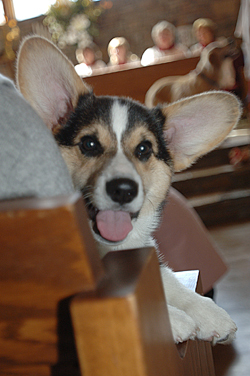 Twelve-week old Alfie, a Pembrooke Corgi, above, was typical of the dogs in the congregation, taking over the pews and singing along with the choir. Alfie';s owner, Gay Odmark, typified pet owners who wanted to get their dogs blessed along with the theme, "Lord help me be the person my dog thinks I am." For richer and for poorer?